You'll need to create a new Category [of the proper type] and then use 'Batch Change' to move the transactions (txns) from the old Category's Account to the new Category's Account. Always make sure that you have a recent, working backup or copy of your data file before using 'Batch Change'. 'Batch Change' is a powerful tool. If a mistake is made using 'Batch Change' with multiple txns selected, things can get ugly in a hurry. 1) Create the new Category [of the proper type]. Menu bar > Tools > Categories > New > Select the desired type > Fill in / Select the particulars for the new Category. Click OK.
2) Again, Menu bar > Tools > Categories. Locate the old Category that you want to move the txns out of and right click it (CTRL-click for Mac). Choose 'Open in a New Window'. 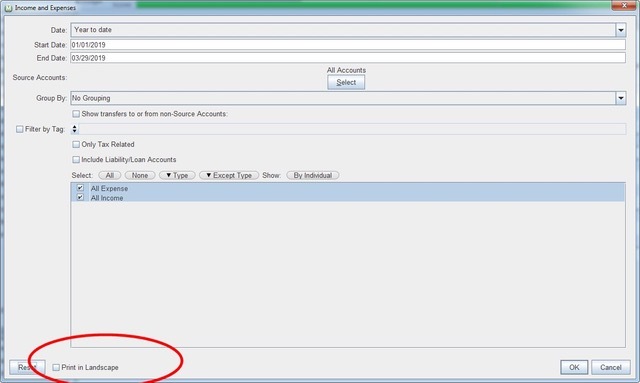 Doing so will open the Category Account register for that Category in a new window. 3) Make sure that the 'ALL' filter is applied. Filters reside along the top of the register. 4) Select (highlight) any txn, then use key-combo CTRL-A. All of the txns in the register should now be selected (highlighted). 5) Right click (CTRL-click for Macs) any one of the highlighted txns. From the resulting context menu, choose 'Batch Change', then 'Account'. (That is not a typo. You are changing the Account of the Category). From the resulting drop-down list, select the name of the new Category Account that you created in Step 1. 6) You can now close the New Window. I realize that when written out like this, the instructions seem complex and convoluted but in actuality, they are quite simple to put into motion. Again make sure that you have a backup of your data file before attempting this procedure. Sounds complicated… I thought I could just go to accounts and categories and there were would be a drop down that had expenses and income. Where do I look for my backup of Money tax on my mac? Thank you for the instructions what does ’txn’ stand for? what does ’txn’ stand for? The first sentence of my instructions indicates that 'txn' stands for transaction. The instructions state to "Select (highlight) any txn, then use key-combo CTRL-A." Oh you’re right….don’t know how I missed that. Hi I just figured it out it should be Command A on the mac that select ALL Thanks again. On Windows at least you do this by selecting the starting transaction you want to include scroll to the last then while holding down the shift key select that transaction. The group of transactions should be selected. Moneydance is using standard Operating systems methods to achieve this. I’m using a Mac is it a different process? Also a windows user but google suggests just hold down the shift key and click on the first and last items. I will try that when I’m back on it.. Thanks for the suggestion. I appreciate it and hope it works on my Mac. Look to the lower left-hand corner of the report parameters window for the 'Print in Landscape' setting. I Must say you’ve been very helpful in answering all my inquiries so thank you again for all your support This always quick and easy to understand. You're welcome. I appreciate the kind words. I'm glad to be of help.